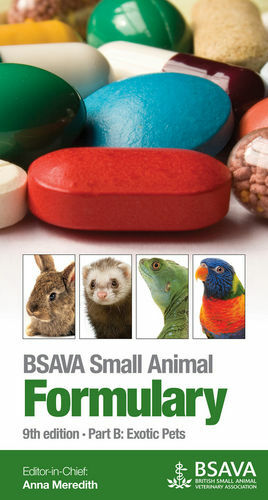 Following the tried and trusted format of previous editions of the popular BSAVA Small Animal Formulary, Part B of the 9th edition covers small mammals, birds, reptiles, fish and amphibians. There are few licensed products for treatment of non-traditional companion animal species and this formulary draws on a wide range of published sources and expert opinion of common drug usages to provide a single referenced source of drug dosages for use in exotic pet species. • Explains the important differences in physiology and metabolism between the species groups that may make them respond to and process drugs very differently, the understanding of which is essential to avoid potential toxicity or lack of efficacy.